Few months ago, I published a list of things I want to do/accomplish as long as I'm alive. The things I listed there are realistic---or so I think. Finally, after who knows how long, I am crossing out something in that Bucket List! My blog was barely three months old when I first applied for Google Adsense. As expected, it was declined. I searched online on how I could improve my blog, asked for pieces of advice from fellow bloggers and spent time creating useful articles to build a good readership. I got rejected six times before I was finally approved to be their publisher! So, to those who are feeling hopeless about it, don't give up. Every blogger had been in your shoes. Honestly, when I first created this blog, earning from it was my motivation. But as time passed by, I realized that it is more than that. This blog became my outlet for all the dramas I encounter in life and earning is just secondary. Nevertheless, I am so happy that all my hard work for Google Adsense paid off after what, two long years?! -and also remember from which country your payment was processed. Some WUMT agents would ask about your relationship to the sender. Just tell them that you are a "publisher" of Google. :) They might also ask some security questions which you provided in your Adsense account, so be sure to be aware of them too. To learn more about the things I hope to do in the coming days, visit my Bucket List. I know I will cross out something again, just one happy step at a time! wooow! 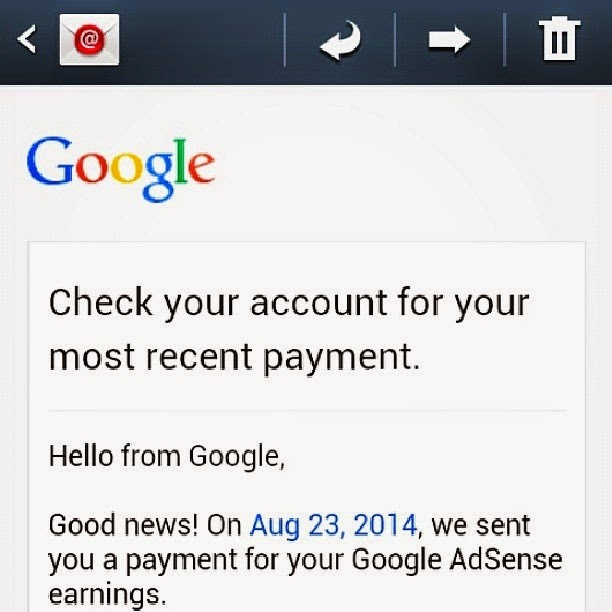 congrats on your first adsense earnings! i also wanted to monetize my blog like you! >XD any tips? what groups should i join? where do i promote my site? and any other stuff to boost earnings? >XD thanks!